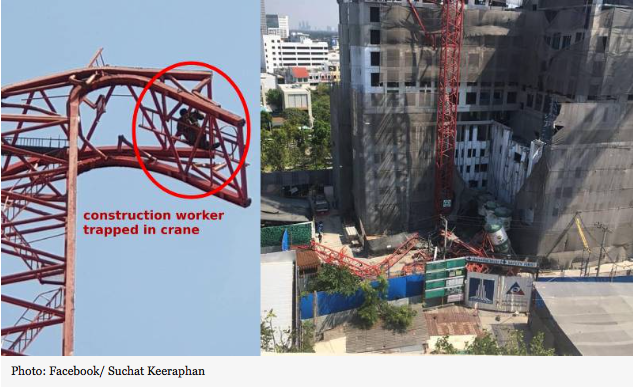 The death toll now stands at five following yesterday’s horrific crane accident in Bangkok, while the construction project’s engineer is facing potential charges. They should have stuck with bamboo scaffolding. "After a brief investigation of the wreckage, civil engineer Chulert Jitjurjun said the collapsed crane has been in use for many years and that its age may have played a factor." No based on the way the tower has folded over I would say the driver lifted something way over it's capacity. All the markings of being overloaded. Working around cranes in the States, most cranes in the last 10 years or so have limit shuts down on them. It will sound alarms and basically shut it down, thus stopping the lift if you are over capacity. Plus 99 percent of the cranes have onboard scales. Yes they can be over ridden if the operator hits the controls. But any smart operator will not over ride the controls. I have been on some spooky lifts.